We're very excited to announce the official establishment of the Andrew E. Crapol Scholarship Fund at the College of William & Mary. Through all of your wonderful generosity and support, our expectations have been surpassed, with an endowment coming in just our first year of trying. These efforts are a beautiful testament to Andy's love of his time at William & Mary and the game of soccer, as well as your love for Andy. 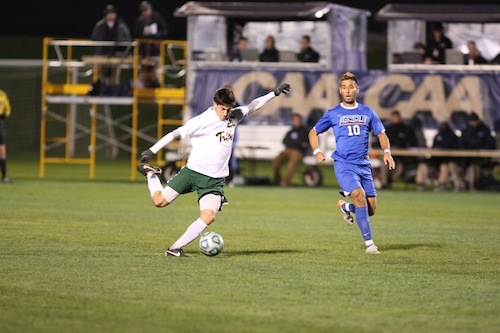 An endowment has been established in loving memory of Andrew E. Crapol ’00 at the College of William & Mary to support a scholarship for a member of the men’s soccer team. Created through an outpouring of generosity from family and friends, the Andrew E. Crapol Scholarship Fund will provide assistance to a student athlete who demonstrates, as Andy did so well, outstanding leadership and team spirit. Jovial and energetic, caring and successful — words are insufficient to describe the life that was tragically cut short in March of this year, but the numerous friends, admiring teammates, and loving family members that Andy left behind are powerful testimony to the remarkable Williamsburg native. A four-year athlete in both high school and college, Andy was a member and leader of William & Mary’s men’s soccer team from 1996 to 2000, winning the Coach’s Award (since renamed the Crapol Award) his senior year. Equally avid about learning as he was about soccer, Andy’s natural curiosity about the world took him to America’s capital and London following receipt of his Bachelor of Arts in economics. He subsequently pursued his interest in the legal profession, earning his Juris Doctor from the University of Virginia in 2005 and joining the international firm Debevoise & Plimpton as an associate. In January 2009, he married his longtime sweetheart, Allison Simmons Crapol ’03. As one person has remarked, “The mold was broken with Andy Crapol, and we were all enriched by his time with us.” Although he is keenly missed, Andy’s spirit is still very much alive at his alma mater. With this scholarship, his legacy will be further enlarged through future Tribe soccer players. BE IT FINALLY RESOLVED that the trustees of The College of William & Mary Foundation hereby accept this commitment and establish the Andrew E. Crapol Scholarship Fund.